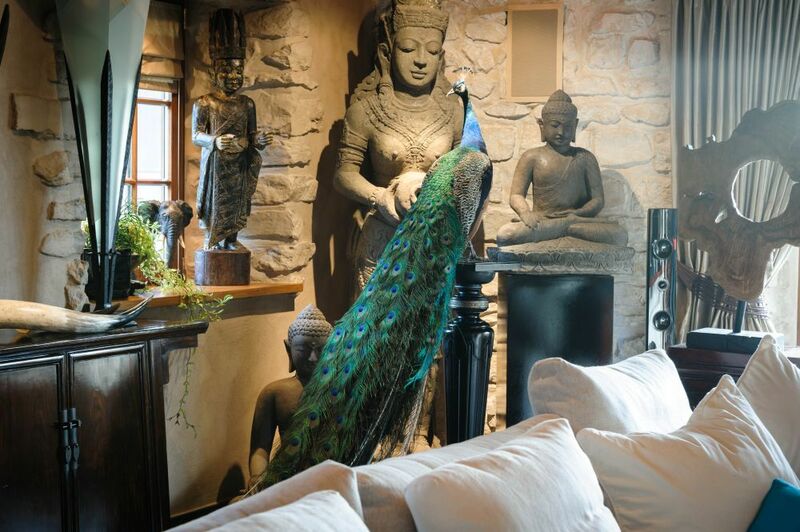 The Indian peafowl or blue peacock is a large and brightly coloured bird belonging to the pheasant family. 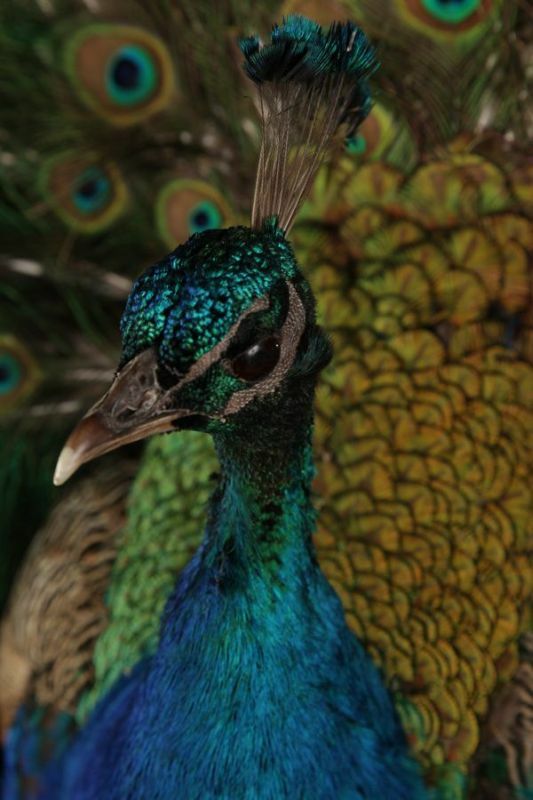 This peafowl is native to South Asia but has been introduced in many other lands of the world. The male indian peafowl is predominantly blue with a fan-like crest of spatula-tipped wire-like feathers and is best known for the long train made up of elongated upper-tail covert feathers which bear colourful eyespots. 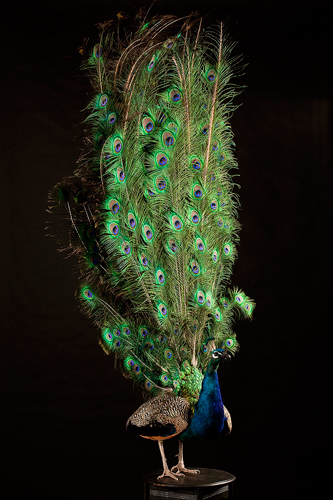 These stiff and elongated feathers are raised into a fan and quivered in a display during courtship. The female lacks the train, has a greenish lower neck and a duller brown plumage. The Indian peafowl is found mainly on the ground in open forest or on land under cultivation where they forage for berries, grains but will also prey on snakes, lizards, and small rodents. Their loud calls make them easy to detect and in forest areas often indicate the presence of a predator such as a tiger. They will usually try to escape on foot through undergrowth and avoid flying, though they will fly into tall trees to roost. The blue peafowl is the national bird in India. 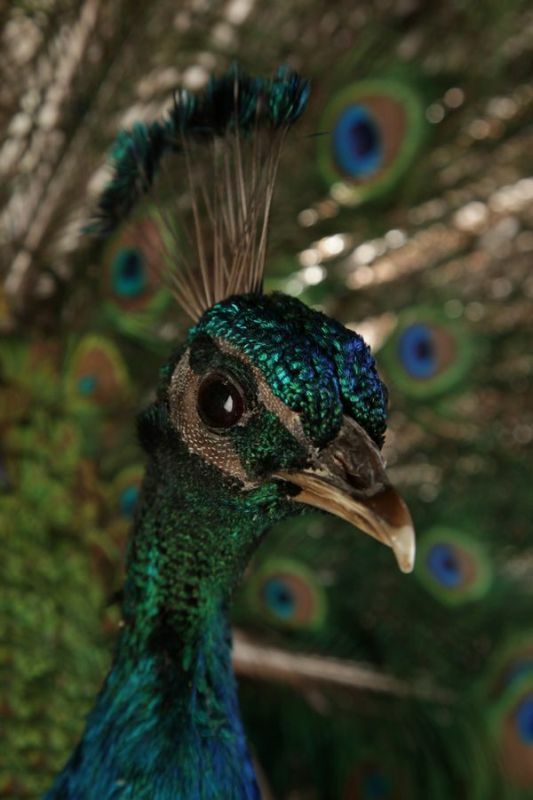 A sub-species of the blue peafowl (pavo cristatus) is the white peacock (pavo cristatus alba). This last stuffed bird is a popular item in taxidermy decorating ideas.